ICAR ASR and NET exam preparation tips - Find the best tips and tricks. 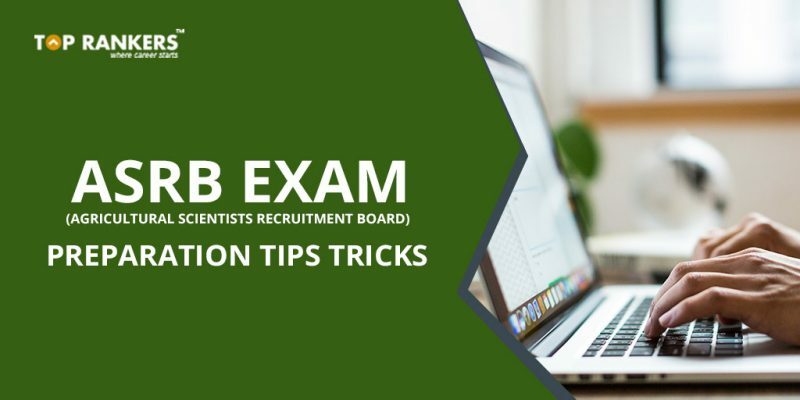 ICAR ASR and NET exam preparation tips – Learn the tricks to crack the exams. ICAR ASR and NET exam preparation tips – Ace the examination. The Agricultural Scientists Recruitment Board (ASRB) of Indian Coucil of Agricultural Research conducts ARS examination and NET examination; recruitment of Scientists in Agricultural Research Services of ICAR is done via ARS and of Lecturers/Assistant Professors in agricultural universities across India is done via NET. The official notification regarding the recruitment drive is expected to be released in the month of March next year. You have to be a citizen of India, Nepal, Bhutan, or a Tibetan refugee to flfill the eligibility criteria. For ARS examination, you have to be between 21 to 32 years of age. You also have to possess a Master’s degree or equivalent in the related field of agriculture and specialization. For NET examination, you have to be at least 21 years of age whereas there is no upper age limit. And a Master’s degree or equivalent in the related stream and specialization. Both the papers are held online and questions are asked in English and Hindi languages. To help you prepare better, we have mentioned a list of tips and tricks. Since you have around 7 months left for the examination, you can utilize this time effectively to score as much as possible. You can prepare a proper time table for study hours, break time, and other recreational activities. And you have to stick to it regularly. This organized approach ensures the best possibe use of your time. First of all, you need to divide all the syllabus topics based on their importance. The importance of a topic can be decided based on the number of questions that comes in the examination from a particular topic and on the marks alloted. Prepare for each topic accordingly to have the highest chance of success. Preliminary examinations are of objective nature; therefore, focus on topics from where MCQs are asked. You can prepare accordingly for the main examination. It is advisable to makes notes as you study and solve problems. Write down important points in your own language. During the last few days, you wouldn’t get time to go through the complete syllabus. At this time, you can look at the notes and revise all the key points in a short span of time. Writing mock tests helps you understand your skills and improve your speed. It also enhances your writing skills for descriptive questions asked in the Main examination. You can’t afford to skip sleeping and eating for the sake of studying. This will hamper your skills in the long term. It is advised to consume a lot of fruits and vegetables; and ensure to sleep 8 hours daily. So, dear ASR and NET aspirants, these are a few tips and tricks you can make use of. If you have any other ideas, you can always follow them along with these ones. Liked our post on ICAR ASR and NET exam preparation tips? Stay tuned for more such hacks, tips, and tricks.